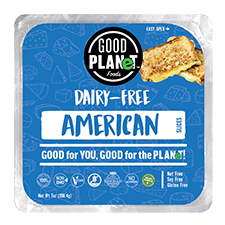 It’s America’s first true non-dairy yogurt starter! 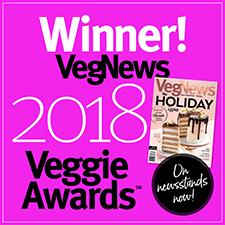 Yogo makes all natural, delicious and creamy vegan yogurt that’s good for you with billions of live cultures and no additives or preservatives. Now you can make a true non-dairy homemade yogurt from any type of milk for only pennies a day! Yogo is gluten-free, non-GMO, and contains 2 billion live cultures per gram. It can be made with soy, almond, coconut or other types of dairy-free milks, whereas many starters won’t work as well with vegan options. 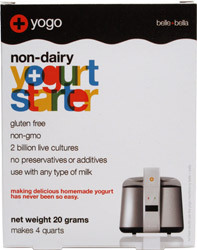 It can be used with any yogurt maker, and each package of Yogo makes 4 quarts of yogurt. Best yet, Yogo doesn’t require refrigeration while still in the original packaging, unlike most starters that need to be kept cold constantly until use, making it convenient to ship anywhere! $6.99 per package. From Anonymous of North fork, California on 4/25/2017 . Well I used almond milk and it separated and was really gross. Help!! From Monika + Werner Beetschen+Gerritsen of Sornetan, Switzerland on 7/2/2015 . I use it without yoghurt machine: just a pot of plant milk in a pot water that is just enough warm/hot you can still have your hand inside and than do it overnight in a warm place with some clothes around. Than save a little glas of yoghurt as next starter, eat the yoghurt(eg. with fruits/müesli) or cool it. I would love it, if it was made with an organic process, but at least its vegan. I hate yoghurt (also the vegans), but I love it to make it myself for our son and my husband. And to know its with real vegan bacteries not cow milk bacteries, no added sugar and soooo economic and so fast made (after finding 2 pots: 5min. ).